“Ladies and gentlemen, boys and girls, lovers of Japanese woodblock art: Let’s get ready to rumble!” said Daniel McDermon in The New York Times. Nineteenth-century printmakers Utagawa Kunisada and Utagawa Kuniyoshi, who “indelibly” shaped Japan’s popular visual culture (and thus ours), both trained under the same master and went on to create their own takes on mythical beasts, tales of adventure, and the famous Kabuki actors of their time. Legend has it that the younger artist, Kuniyoshi, after one day seeing Kunisada pass by on a riverboat surrounded by adoring women, burned with envy and worked feverishly to outdo him. Did he succeed? Boston’s Museum of Fine Arts has gathered 100 of the rivals’ prints and invited viewers to pass a verdict. Treating Kunisada and Kuniyoshi as if they were contenders in a Food Network cookoff is no way to honor their accomplishments, said David Curcio in ArtsFuse.org. In a way, they worked in harmony, each play- ing to a different segment of the art market in Edo, the city that would be renamed Tokyo in 1868. 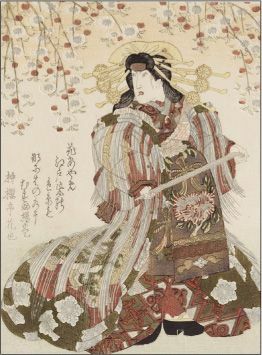 Kunisada (1786–1864) produced “lighter, airier” work, answering the demand for art that presented life as a peaceful passage enriched by pleasures like theater. 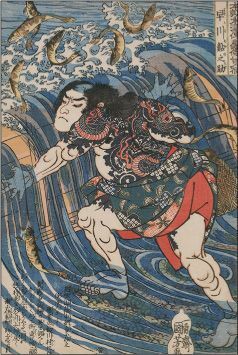 He created countless reproducible images of popular actors, combining “a perfect fidelity to craft” and passages of “almost unimaginably dense detail.” Kuniyoshi (1797–1861) focused instead on action—snarling beasts, giant leaping fish, tattooed warriors, and swashbuckling bandits. Even when he created a triptych of the same three actors Kunisada had featured in a circa-1829 triptych, his version was more dynamic and formally inventive. For at least one album, the National appears done with being a rock band that reliably produces “excellent background music”— the sonic equivalent of “extremely well-made dark-wooden furniture,” said Tom Breihan in Stereogum.com. The seventh album from the Brooklyn-born quintet is darkly moody as always. But it’s also “the best thing they’ve done” since 2007’s Boxer, because the boys have “jacked up the urgency” and made a record that’s “actually about something.” Lead singer Matt Berninger, who wrote the lyrics with his wife, uses his morose baritone voice to plumb the eternal struggle to stay in a marriage despite all the disappointments each partner brings home. Sleep Well Beast isn’t the National’s greatest record, but it’s “one of the band’s richest, most interestingly textured albums to date,” said Jude Clarke in DrownedInSound.com. And “the things that make this band a real treasure can all still be found here,” including Berninger’s “slightly beat-up romanticism” and “the big bold beauty” of the group’s melodies.